Milton Supman (January 8, 1926 – October 22, 2009), known professionally as Soupy Sales, was an American comedian, actor, radio/television personality, and jazz aficionado. He was best known for his local and network children's television show Lunch with Soupy Sales (1953-1966), a series of comedy sketches frequently ending with Sales receiving a pie in the face, which became his trademark. From 1968-75, he was a regular panelist on the syndicated revival of What's My Line? and appeared on several other TV game shows. During the 1980s, Sales hosted his own show on WNBC-AM in New York City. Milton Supman was born in Franklinton, North Carolina, to Irving Supman and Sadie Berman. His father, a Jewish dry goods merchant, had emigrated from Hungary in 1894. Sales had three siblings: Marvin Supman (1916–1920), Dr. J. Leonard Supman (1918–1998) of Kingsport, Tennessee, and attorney Jack Supman (1921–2014) of Lancaster, Ohio. His was the only Jewish family in the town; Sales joked that local Ku Klux Klan members bought the sheets used for their robes from his father's store. Sales got his nickname from his family. His older brothers had been nicknamed "Ham Bone" and "Chicken Bone." Milton was dubbed "Soup Bone," which was later shortened to "Soupy". When he became a disc jockey, he began using the stage name Soupy Hines. After he became established, it was decided that "Hines" was too close to the Heinz soup company, so he chose Sales, in part after vaudeville comedian Chic Sale. He graduated from Huntington High School in Huntington, West Virginia in 1944. He enlisted in the United States Navy and served on the USS Randall (APA-224) in the South Pacific during the latter part of World War II. He sometimes entertained his shipmates by telling jokes and playing crazy characters over the ship's public address system. One of the characters he created was "White Fang", a large dog that played outrageous practical jokes on the seamen. The sounds for "White Fang" came from a recording of The Hound of the Baskervilles. Sales enrolled at Marshall College in Huntington, WV, where he earned a master's degree in Journalism. While at Marshall, he performed in nightclubs as a comedian, singer and dancer. After graduating, Sales began working as a scriptwriter and disc jockey at radio station WHTN (now WVHU) in Huntington. He moved to Cincinnati, Ohio in 1949, where he worked as a morning radio DJ and performed in nightclubs. Sales began his television career on WKRC-TV in Cincinnati with Soupy's Soda Shop, TV's first teen dance program, and Club Nothing!, a late-night comedy/variety program. 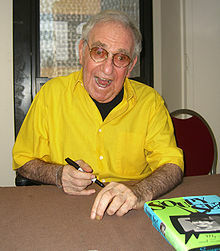 Sales is best known for his daily children's television show, Lunch with Soupy Sales. The show was originally called 12 O'Clock Comics, and was later known as The Soupy Sales Show. Improvised and slapstick in nature, Lunch with Soupy Sales was a rapid-fire stream of comedy sketches, gags, and puns, almost all of which resulted in Sales receiving a pie in the face, which became his trademark. Sales developed pie-throwing into an art form: straight to the face, on top of the head, a pie to both ears from behind, moving into a stationary pie, and countless other variations. He claimed that he and his visitors had been hit by more than 20,000 pies during his career. He recounted a time when a young fan mistakenly threw a frozen pie at his neck and he "dropped like a pile of bricks." Lunch with Soupy Sales began in 1953 from the studios of WXYZ-TV, Channel 7, located in the historic Maccabees Building, in Detroit. Sales occasionally took the studio cameras to the lawn of the Detroit Public Library, located across the street from the TV studios, and talked with local students walking to and from school. Beginning no later than July 4, 1955, a Saturday version of Sales's lunch show was broadcast nationally on the ABC television network. His lunchtime program on weekdays was moved to early morning opposite Today and Captain Kangaroo. During the same period that Lunch with Soupy Sales aired in Detroit, Sales also hosted a nighttime show, Soup's On, to compete with 11 O'Clock News programs. The guest star was always a musician, often a jazz performer, at a time when jazz was popular in Detroit and the city was home to twenty-four jazz clubs. Sales believed that his show helped sustain jazz in Detroit, as artists would regularly sell out their nightclub shows after appearing on Soup's On. Coleman Hawkins, Louis Armstrong, Duke Ellington, Billie Holiday, Charlie Parker, and Stan Getz were among the musicians who appeared on the show; Miles Davis made six appearances. Clifford Brown's appearance on Soup's On, according to Sales, may be the only extant footage of Brown, and has been included in Ken Burns' Jazz and an A&E Network biography about Sales. Sales briefly had a third dinner time show filmed largely in the Palmer Park section of Detroit. Sales' three shows were rumored to have earned him in excess of $100,000 per year. One of his character puppets was Willy the Worm, a "balloon" propelled worm that emerged from its house and used a high pitched voice to announce birthdays or special events on the noontime show; but the character never appeared when Soupy moved to Los Angeles. In his lunchtime show, Sales always wore an orlon fabric sweater. In many of his shows, he appeared in costume, performed his dance, the Soupy Shuffle, introduced many characters such as Nicky Nooney, the Mississippi Gambler, etc., and took "zillions" of pies in the face. In 1960, Sales moved to the ABC-TV Studios in Los Angeles. ABC-TV cancelled the show in March 1961, but it continued as a local program on KABC-TV until January 1962. The show briefly went back on the ABC network as a late night fill-in for The Steve Allen Show in 1962 but was canceled after three months. All of the puppets on the show during its Los Angeles run were also operated by Clyde Adler. A 1962 TV Guide listing refers to him as "West Coast disk jockey and comedian". His fame was significant enough to warrant utilizing him as a "Tonight" show guest host in the period between Jack Paar and Johnny Carson. 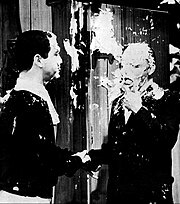 As Sales' guest, Frank Sinatra was no more immune to a pie in the face than his host. On September 7, 1964, Sales found a new weekday home at WNEW-TV in New York City. This version was seen locally until September 2, 1966. 260 episodes were syndicated by Screen Gems to local stations outside the New York market during the 1965–66 season. This show marked the height of Sales' popularity. It featured guest appearances by stars such as Frank Sinatra, Tony Curtis, Jerry Lewis, Judy Garland and Sammy Davis Jr., as well as musical groups like the Shangri-Las, The Supremes and The Temptations. The New Soupy Sales Show appeared in 1978 with the same format, and ran for one season. 65 episodes were briefly syndicated, through Air Time International, to local stations in early 1979. It was taped in Los Angeles at KTLA, with Clyde Adler returning to work as a puppeteer with Sales. Clyde Adler, the show's floor manager and a film editor at Detroit's WXYZ-TV, performed in sketches and voiced and operated all puppets on Sales' show in Detroit in the 1950s and in Los Angeles from 1959 to 1962, as well as in 1978. Actor Frank Nastasi, who played the part of Gramps on WXYZ-TV's other kids show "Wixie Wonderland", assumed the role of straight man and puppeteer when Sales took the show to New York from 1964 to 1966. Nastasi was originally from Detroit and had worked with Sales at WXYZ. Appearing on the show were both puppets and live performers. White Fang, "The Biggest and Meanest Dog in the USA", who appeared only as a giant white shaggy paw with black triangular felt "claws", jutting out from the corner of the screen. Fang spoke with unintelligible short grunts and growls, which Soupy repeated back in English, for comic effect. White Fang was often the pie thrower when Soupy's jokes bombed. Black Tooth, "The Biggest and Sweetest Dog in the USA", also seen only as a giant black paw with white triangular felt claws, and with more feminine, but similarly unintelligible, dialogue. Black Tooth's trademark was pulling Soupy off-camera to give loud and noisy kisses. For a short time there was a third dog character that became White Fang's girlfriend, Marilyn Monwolf. She caused some rivalry of affections between Black Tooth and White Fang, but later jilted them both for Joe Dogmaggio. Pookie the Lion, a lion puppet appearing in a large window behind Soupy (1950s), was a hipster with a rapier wit. For example: Soupy: "Do you know why my life is so miserable?" Pookie: "You got me!" Soupy: "That's why!" One of Pookie's favorite lines when greeting Soupy was, "Hey bubby... want a kiss?". In the Detroit shows, Pookie never spoke but communicated in whistles. That puppet also was used to mouth the words while pantomiming novelty records on the show. Hippy the Hippo, a minor character who occasionally appeared with Pookie the Lion. Frank Nastasi gave Hippy a voice for the New York shows. Clyde Adler also voiced Hippy in the shows done in the late 1970s. On January 1, 1965, miffed at having to work on the holiday, Sales ended his live broadcast by encouraging his young viewers to tiptoe into their still-sleeping parents' bedrooms and remove those "funny green pieces of paper with pictures of U.S. Presidents" from their pants and pocketbooks. "Put them in an envelope and mail them to me", Soupy instructed the children. Several days later, substantial amounts of money had begun arriving in the mail; Sales stated that the total amount received was in the thousands of dollars but qualified that by stating that much of that was in play money. Sales said he had been joking and that whatever real money had been sent would be donated to charity, but as parents' complaints increased, WNEW's management suspended Sales for two weeks. One of the fans of the Soupy Sales show was Frank Sinatra. When Sinatra started his own record label, Reprise Records, he signed Sales to a recording contract. Two albums were produced with Reprise, The Soupy Sales Show in 1961 and Up In The Air in 1962. Sales' novelty dance record, '"The Mouse" dates from the mid-1960s period of his career, when his show was based in New York. Sales performed "The Mouse" on The Ed Sullivan Show in September 1965, just prior to The Beatles' segment on the show. Sales signed with Motown Records in 1969 releasing a single, "Muck-Arty Park" (a play on the 1968 hit "MacArthur Park"), as well as an album A Bag of Soup. Soupy and Frank Nastasi also cut and recorded a comedy and song story disk "Spy With A Pie" for ABC/Paramount. "Spy With A Pie" was rereleased by "Simon Says" children's records. From 1968–75, Sales was a regular panelist on the syndicated revival of What's My Line?. (He had been a guest panelist on one episode of the original version in 1965.) Sales usually was the first panelist introduced and occupied the chair on the far left side (facing the camera), next to Arlene Francis. In 1969, Sales appeared on Storybook Squares, a children's version of Hollywood Squares, as Henry VIII. In 1976, Sales was the host of Junior Almost Anything Goes, ABC's Saturday morning version of their team-based physical stunt program. Sales was also a panelist on the 1980 revival of To Tell the Truth; he had appeared as a guest on the show during the mid- to late 1970s. Other game show appearances included over a dozen episodes of the original Match Game from 1966 to 1969 as well as one week of the revived version in 1976, a week of shows on the 1970s edition of The Gong Show, a couple guest spots on Hollywood Squares (December 12, 1977 and April 4, 1978) as well as a few appearances on the combined version (Match Game-Hollywood Squares Hour) in 1983–84 and a recurring role in all versions of Pyramid from 1973 to 1988 and 1991; in one famous episode, he repeatedly uttered the word "bacon" in an attempt to get a confused contestant to say "greasy things". He also made an appearance on Pictionary in 1997. Sales hosted a midday radio show on WNBC in New York from March 1985 to March 1987. His program was between the drive time shifts of Don Imus (morning) and Howard Stern (afternoon), with whom Sales had an acrimonious relationship. An example of this was an incident involving Stern telling listeners that he was cutting the strings in Sales' in-studio piano at 4:05 p.m. on May 1, 1985. On December 21, 2007, Stern revealed this was a stunt staged for "theater of the mind" and to torture Sales; in truth, the piano was never harmed. Sales' on-air crew included his producer, Ray D'Ariano, newscaster Judy DeAngelis, and pianist Paul Dver. Sales was vocal in his dislike for Birds Do It. 1993 – And God Spoke: The Making of... His memorable appearance as himself, hired by two incompetent filmmakers to portray Moses because Charlton Heston was not available. Sales's first dramatic acting roles came in 1960 as an unnamed stable owner in "The Legacy" and as Meyers in "The Hope Chest" on the ABC western television series, The Rebel, starring Nick Adams. Sales appeared as himself in one of the later episodes of the CBS military sitcom/drama series, Hennesey, starring Jackie Cooper. Sales made several guest appearances on The Carol Burnett Show. 1963 - Sales played "Hank Salamanca" a musician guest at the farm on The Real McCoys, episode 32 "The McCoy Sound". 1964 – "This is Going to Hurt Me More Than It Hurts You" Route 66, Episode 113 in the fourth and last season, fourth to last episode. 1969 – The Beverly Hillbillies - Milburn Drysdale's nephew, Air Force ace Jet Bradford. 1989 - Monsters (TV series) - Season 2 Episode 6, Traveling Salesman. 1994 - ‘’Wings (TV series) - Season 6 Episode 8, titled Miss Jenkins. Soupy plays a character named Fred Gardner. He performs Simon Says with Lowell. 2001 – Black Scorpion – super-villain Professor Prophet. Sales was married twice: first to Barbara Fox (from 1950 until their divorce in 1979). They had two sons, both of whom are rock musicians: bassist Tony Sales and drummer Hunt Sales (who were in the band Tin Machine with David Bowie). In 1980, Sales married dancer Trudy Carson, who survives him. Sales died on October 22, 2009, at Calvary Hospice in Bronx, New York, aged 83, from cancer. He is buried at Kensico Cemetery in Valhalla, New York. ABC replaced The Soupy Sales Show in 1961 with Cynthia Pepper's short-lived sitcom, Margie. Sales and Pepper later became good friends. Howard Stern named Sales as one of his childhood heroes, and in an interview on the 2007 Sirius Satellite Radio program "The History of Howard Stern", he expressed regret over his harsh words and actions towards Sales. Cited as an influence by Iggy Pop in the movie Gimme Danger. Pop included both of Sales's sons Hunt and Tony as part of his backing band. A package of Soupy Sales reruns that includes the entire 1979 series and 14 black-and-white episodes from the 1964–66 run is available for syndication. It has aired since 2011 on Jewish Life Television and since 2013 on Retro Television Network, the latter of which airs the show once a week. ^ a b c d e f Goldstein, Richard (October 23, 2009). "Soupy Sales, Slapstick Comedian, Dies at 83". The New York Times. pp. A26. Retrieved October 23, 2009. ^ Kingsport Post, May 14, 1970, page A-3 – Mrs. Harry Baker (Obituary); retrieved July 3, 2015. ^ a b Find-A-Grave – Selma "Sadie" Berman Baker; retrieved July 3, 2015. ^ a b Ratliff, Ben (October 23, 2009). "Soupy Sales, Jazz Maven, Brought Gigs to the Small Screen". The New York Times. Retrieved October 24, 2009. ^ Obituary for Jack Supman, legacy.com; retrieved July 3, 2015. ^ Ancestry.com, Social Security Death Index – Dr. J. Leonard Supman; retrieved July 3, 2015. ^ Find-A-Grave – Marvin Supman; retrieved July 3, 2015. ^ Ancestry.com, 1920 United States Federal Census, Franklinton (NC); retrieved July 3, 2015. ^ Carlson, Michael (October 31, 2009). "Soupy Sales: Anarchic and pioneering children's TV personality", The Independent; accessed October 22, 2018. ^ Soupy's Soda Shop details Archived 2014-01-18 at the Wayback Machine, amdest.com; accessed August 30, 2015. ^ Soupy Sales' debut on New York channel 7 (as a summer replacement for Kukla, Fran and Ollie) was reviewed on July 5, 1955 (full article may only be available to nytimes.com subscribers) Shanley, J. P. "TV: Saved by Shaw". New York Times. New York Times. Retrieved September 27, 2014. ^ a b c Donaldson, Bill (February 2003). "Interview with Soupy Sales, December 28, 2001". Cadence Magazine. Redwood, New York: Cadnor Ltd. 29 (2): 9–12. ISSN 0162-6973. ^ Hinckley, David (October 23, 2009). "Friend remembers Soupy Sales as someone who'd 'do anything for you'". Daily News (New York). Retrieved October 24, 2009. ^ "Soupy Sales, 1926–2009". New York Post. October 24, 2009. Retrieved October 24, 2009. ^ "FACT CHECK: Soupy Sales' 'Green Pieces of Paper' Scandal". ^ "Beloved By 60's Era Kids, TV Host Soupy Sales Dead". CBS News. October 22, 2009. Archived from the original on August 8, 2010. Retrieved October 23, 2009. ^ Sales, Soupy; Charles Salzberg (2001). Soupy Sez! My Life and Zany Times. New York: M. Evans and Co. ISBN 0-87131-935-7. ^ Profile, CrazyCollege.org; accessed August 30, 2015. ^ Schwartz, David; Ryan, Steve; Wostbrock, Fred (1999). The Encyclopedia of TV Game Shows (3rd ed.). New York, NY: Checkmark Books. p. 209. ^ "Soupy Sales". Turner Classic Movies. ^ "The Carol Burnett Show - TV Guide". TVGuide.com. ^ The New York Daily News, Friday, October 23, 2009. 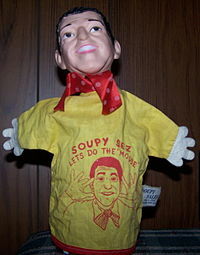 Wikimedia Commons has media related to Soupy Sales. This page was last edited on 11 April 2019, at 22:16 (UTC).